July in our lawns and gardens means bugs, bugs and more bugs. Many of these bugs are none damaging and can actually benefit our gardens. However, that is not the case with many beetles, including the Japanese beetle. In store, we have noticed for the past two weeks that questions and concerns regarding beetles have really peaked. What type of damage do they cause? The Japanese beetle has a very “damaging” life cycle that repeats year after year. They like to damage our gardens (especially vegetables and fruit-bearing trees) in the summer time as adult beetles. As young larvae, the Japanese beetle is a white grub and they damage our lawns in the fall, and sometimes a little in the spring. This is truly a pest that you do not want to have in your yard, since it can mean headaches throughout the growing season! How can you eliminate them? 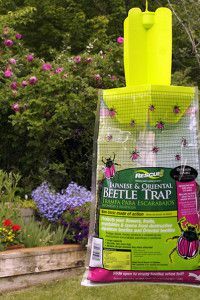 To trap the garden-damaging beetles, the beetles traps (bags) are the popular solution. These traps have been around for years, but are growing increasingly hard to find. We still have them from a couple of different companies. If the beetles are concentrated on a particular plant or tree, you might want to consider the contact kill beetle killers that we have. These are typically a liquid spray and they are safe for non-edible plants. We have them from a few different companies as well..